I decided to post some of my comments here about it because I thought it would be interesting to share a little more about how the Japanese managers taught Lean at NEC in Brazil. The Brazilian operations had decided to start implementing Lean manufacturing in the middle 1990’s because the Japanese manufacturing sites were implementing TPS. Since the early 90’s and they had been achieving striking business results in a short period of time. The Japanese sites were battling against the monster of 7 wastes because they were trying to be more competitive. One of main reasons was because most of their manufacturing lines were being shifted to lower cost Southeast Asian countries at that time. To keep the jobs in Japan they were battling to get rid of all the 7 wastes to reduce the costs as much as they could. For those of us who were aware of what Lean concepts and tools can do it means “if you see any kind of waste, try to get rid of it quickly”. Do not spend too much time thinking of it. 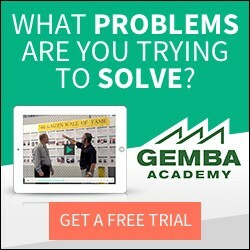 Go to the gemba and do it and think quickly. With this first try, you are going to be able see the next kaizen step. The reasoning is the same as when any of us using a Value Stream Mapping tool. As we draw the current state, many ideas of improvements for the future state start to come up. The more you do kaizen, the more you see. Was the Lean Team nuts? To us it seemed like what we were doing before we learned Lean was nuts!